Required Reading: Which book from your school days do you remember reading & enjoying? Is there a book published now that you'd like to see in today's curriculum for kids? The only two books that I read in school that I really enjoyed and that have stuck with me all this time are The Great Gatsby and To Kill a Mockingbird. Both books totally held me captivated, and I remember reading on ahead of the class because I was so curious as to how they would end. Oh, that is awesome. I would love to have a room like that. The lights are a nice touch! How Cute! I Love your reading space! Oh wow I love your reading spot! I looks amazing :) Love the lights! That looks like such a comfy spot and the room is beautiful. Did I mention I absolutely adore your living room? 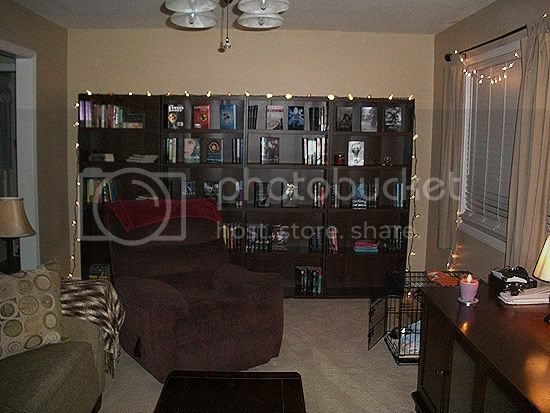 The bookshelves and the lights are lovely! Someday I want to have a living room like this. OMG! I love your bookcases!! I so wish I had room for one of that size! 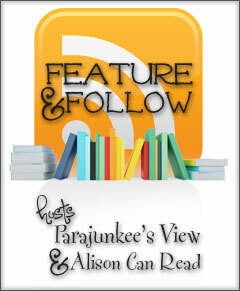 Your reading domain is beautiful!! Seeing a lot of the Great Gatsby, that wasn't really a fave of mine. I didn't like a lot of the books I had to read in school. Took ages til I found one! Lovely reading room - very calm. I adore The Great Gatsby too - Fitzgerald's prose is sublime.Following from the blog hop. You have the neatest bookshelves I have ever seemn! Glad I did not show a pic of mine. (I am a new follower.) I showed a pic of my balcony instead! And being a high schooler myself, I agree completely that we need interesting novels to study, not the boring ones we're forced into studying now. I would love to have an extra room to turn it into a library! That's awesome! I'm looking forward to reading more from you! And I love the lights, too. I'm a new follower via the hop. Oh it's a nice place, I love it! Nice library. 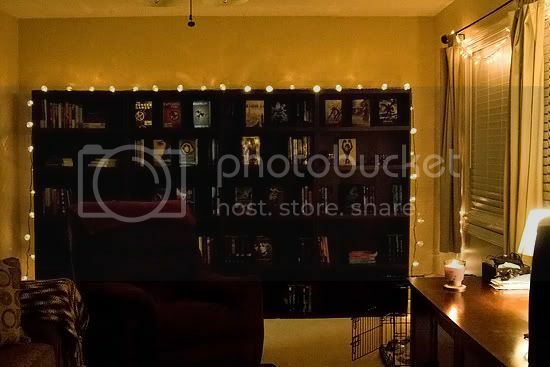 Love the lights around the bookcases. I am so completely jealous of your library! That is my dream room! What an awesome place to sit and read! Love your reading space--and the comfy chair! 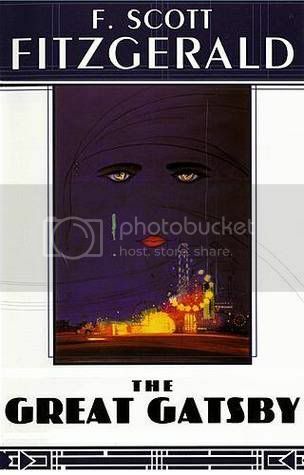 I totally remember The Great Gatsby from HS...one of the few required readings I really enjoyed. Love your reading space and Gatsby is one of my faves, too!